The setting up of a centre for verification of documents of the citizens for inclusion of names in the updated National Register of Citizens (NRC) in the Bajali College campus in Barpeta district has been opposed by a number of present and former student leaders of the college. The student leaders have also demanded removal of the NRC centre from the college campus. 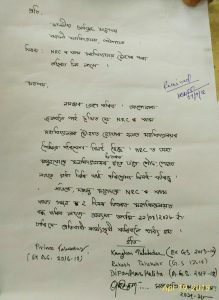 The student leaders on Thursday submitted a letter to the Principal of Bajali College seeking removal of the NRC verification centre from the college campus stating that use of the college campus for the NRC documents verification purpose has not only affected the environment in the college but also created an unhygienic situation in the campus. Urging the college authorities to immediately remove the NRC verification centre from the college campus, the students’ leaders demanded that the activities of NRC update process in the college be stopped within two days and otherwise threatened to launch an agitational programme on April 21, 2018 in protest against setting up of the centre.